"And you, son of man, take a sharp sword, take it as a barber’s razor, and pass it over your head and your beard; then take scales to weigh and divide the hair. You shall burn with fire one-third in the midst of the city, when the days of the siege are finished; then you shall take one-third and strike around it with the sword, and one-third you shall scatter in the wind: I will draw out a sword after them. You shall also take a small number of them and bind them in the edge of your garment. Then take some of them again and throw them into the midst of the fire, and burn them in the fire. From there a fire will go out into all the house of Israel. "Thus says the Lord GOD: 'This is Jerusalem; I have set her in the midst of the nations and the countries all around her. She has rebelled against My judgments by doing wickedness more than the nations, and against My statutes more than the countries that are all around her; for they have refused My judgments, and they have not walked in My statutes.' Therefore thus says the Lord GOD: 'Because you have multiplied disobedience more than the nations that are all around you, have not walked in My statutes nor kept My judgments, nor even done according to the judgments of the nations that are all around you' - therefore thus says the Lord GOD: 'Indeed I, even I, am against you and will execute judgments in your midst in the sight of the nations. One day, quite by accident the passage in (Mark 3:20-21 click on highlighted verse to see scripture). fell open before me describing how Yeshua left the dinner table to minister to a crowd that had gathered outside. It says His behavior was so erratic that his friends sought to 'lay hold on Him' because they thought He was 'beside' Himself. That word 'beside' comes from the Greek existemi and means, literally, insane - they thought He had lost His Mind. So much so, that they tried to physically restrain Him. I asked myself, "What would motivate this Person to behave in such a manner?" I realized that, even after walking with Him for the better part of two decades - I didn't know Him. Not really. Not the way you would know a spouse you had lived with over a long period of time or a friend that had become closer than a brother, where you don't even have to finish sentences with them so innately are you aware of the core of their being. I said, "Lord, I want to know you that way." He said, "OK, but there are some things you will have to do first. You will need to throw away everything you have thought you have come to know about Me, everything anyone has ever taught you about Me, everything anybody has ever said about Me and just go back to my Life - what is chronicled in scripture. Just what the words say on the page - not what you 'think' they might mean, but just what is there. If you lack understanding, ask Me and I will give you understanding." He showed me that Revelation 19:10 speaks of this very tenet - that His Life is the benchmark by which everything is measured - including other scripture. Much has been said of the shaking that has come upon the earth in these final hours without a proper understanding that the shaking in the earth can only come as a result of the shaking that first begins within the household of Elohim (1Peter 4:17) Many try to spiritualize this shaking in order to distance themselves from the reality brought on by what is this beginning of the most terrible and wonderful Day of YHVH. They envision themselves to be part of a 'remnant' of believers who will be somehow 'escape' from the awesomeness of that shaking when the Truth is, as we see in the passage above from Ezekiel 5, those few who are tucked away into the hem of His Garment will only escape by a passage through fire. If you have ever been in a firestorm, you know that nothing escapes - everything is consumed (John 14:9). 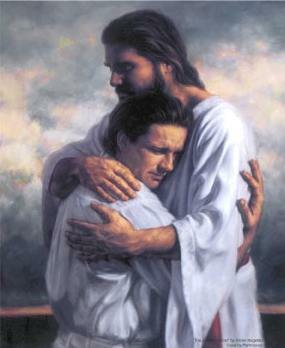 If we are to embrace Yeshua, it can only be in the Way He embraced the Father (Deuteronomy 5:25, see All Flesh). It is from this burning away of the dross beginning within the individual that the fire then spreads throughout the entire believing community, burning the chaff separated from the wheat and then, subsequently, to the world. The words from the passage in Ezekiel above are not spoken to the world, but to "Jerusalem" which in Hebrew means a "teaching of peace" or "habitation of peace" or the "teaching of the habitation of Peace." He is our Peace (Ephesians 2:14, Isaiah 9:6). The famine we are experiencing is not a physical starvation, but a lack of the hearing of His Voice from within to bring the Power of YHVH, Who resides within us, into this earthly realm through our choices in the face of seeming disaster (Amos 8:11-12, John 10: 27-29, see Authority). Yeshua said men do not live by bread alone but by every word that proceeds out of the mouth of the Father (Matthew 4:4). Arrows in scripture refer to words or thoughts (Psalm 64:3). The words or thoughts in our mind are what motivate us into action on the ground. The battleground, then, is in our mind to determine how we respond to the circumstances and situations as they unfold around us. This is the helmet of our salvation - to capture our thoughts and bring them into an obedience to what we know is the Truth of His Goodness in all situations (2Corinthians 10:5, Ephesians 6:17). The famine we are experiencing is a lack of the hearing of His Voice, being taught how to hear His Voice and, subsequently, moving from that direction of hearing His Voice. Yeshua said it is in the teaching of the tradition of men as the commandments of God that we bring to 'none effect' the Power of the habitation of the Peace of Elohim in our lives (Mark 7:7-13). Most will say, "well, tradition is a good thing" and, in so saying, they speak into existence and make a reality of the very essence of what He is trying to convey. For most of us, what we believe is what we have been taught by others - that is precisely the definition of what is known as the "tradition which you have handed down". We attempt to make scripture conform to our doctrines, those practices we treasure in our heart, instead of holding everything suspect until we confirm it in the Light of the Essence of His Nature (see the Glory). What we worship is what we hold in our hearts to be true (Luke 12:33-36). If what we hold in our hearts is not Truth, then we are worshipping vainly. That is to say, we find ourselves worshipping something other than the Nature of Who the Father Is. Vanity means to appropriate for selfish purposes. The fifth commandment says to 'not take the Name of the LORD in vain'. That does not mean 'do not cuss' - it means to not distort, or twist His Essence by fashioning something other than what He intended. Those that do will be held accountable. (Exodus 20:7). Yeshua quoted the prophet Isaiah that it is in teaching the traditions of men that we worship vainly (Matthew 15:9, Isaiah 29:13). One of man's traditions is this worship of scripture as 'The Word' when, without ambiguity in any language, John 1:14 plainly says Yeshua IS the Word. Yeshua Himself upheld this premise in John 5:39. Scripture is scripture. Scripture is NOT the Word. I have been a printer for the better part of 30 years - I know the consistency of ink and paper and how books are constructed. You can set a bible on fire and it will burn. Now, I read scripture every day but there is no Life in the Book. When I had my heart attack (see Preserving Our Life). I had the Book in front of me and laid it on my chest - it didn't do a thing for me. He healed me. He put a new heart in me. The Life is in Him. The Book merely speaks OF Him. This worship of scripture above worshipping Him has come from someone finding a truth in scripture and a 'bible-thump' ensues on everyone around with the supposition that sheer force of entry will produce some sort of holiness. The truth is all it shows is a lack of knowing the Essence of Who the Father is. All it produces is strife and confusion and becomes a breeding ground for every evil work (James 3:16). Another tradition we have embraced is the worship of worship. Somebody read in Psalm 100 that we "…come before His Presence with singing", took that out of context with the rest of the passage and handed us what grew into and is continued today as 'praise and worship' meetings where the minute we walk in the door we are enveloped by this 'wall of sound' so loud it deafens the ears. So, what's wrong with that, you say? It is contrived. Webster defines contrive as: to devise or plan, to form or create in an artistic or ingenious manner. This is not to say it is wicked or impious, but constructed after our own design instead of His. I have nothing against singing. I play the guitar and Ruach haKodesh (the Holy Spirit) has given me many tunes set to scripture. It is the manner in which we approach Him in singing that is being looked at. Read the passage closely in (Psalm 100). There is a process by which we come into His Presence. We must first enter His Gates with thanksgiving, thanking Him in and for the circumstance of our life - in whatever state we might find that life to be in (1Thessalonians 5:18. Ephesians 5:20). As we become thankful, we are then allowed entry to His Court by the praises we offer Him (Psalm 22:3). This Praise is what He inhabits or abides in. What is praise? In Hebrew it is yadah which means to throw, cast or shoot (as arrows) by lauding or confessing before the assembly (Psalm 111:1). It is in the confession of His Goodness toward us before others that we call upon His Name and His Presence becomes manifest (Psalm 16:11). Just because we sing does not mean we automatically enter into His Presence. 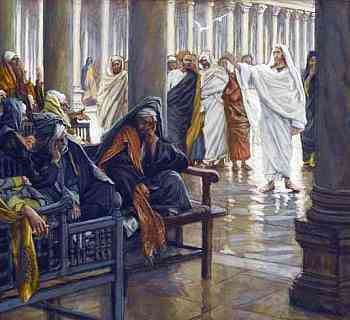 It is impossible to reach His Presence if you are still sitting on the curb by not coming through the gates properly. And you don't have to go somewhere special to accomplish coming into His Presence. This brings us to the next topic of what we have come to worship - the assembly. The Greek word for assembling is episynagoge from the verb (epi-syn-ago) meaning to assemble. This word has 3 parts: ago means to lead, syn means together and epi means at or to. Synago (from which we get synagogue) means to lead or gather together. The word for assembling (epi-syn-agoge) therefore means a gathering together at... but it doesn't say where or when. To find out where, we need to turn to 2Thessalonians 2:1. "Now we beseech you, brethren, by the presence (or coming) of our Lord Jesus Christ, and by our gathering together to him." Here, we have the same word episynagoge, but this time it tells us where! We have to gather together - to Him! He is the meeting place. Yeshua said that whenever two or more are gathered together in Him - that is 'church', the assembly, because they are meeting together with Him (Matthew 18:20). This agrees with what Yeshua Himself said. His words were: 'Come to me' - not 'Go to church' (Matthew 11:28). Church is individuals. We have allowed a mindset to enter into the Body of Christ that 'church' is programs, projects, structures and theologies - all of which require money and hierarchy to establish and maintain And yet, nowhere in scripture is it recorded that Yeshua or the disciples used such measures. He invested Himself in 'relationships' and taught the disciples to do the same (Acts 3:6, 1John 3:16, see What Authority). It is impossible to form a relationship with someone in a crowd of people while staring at the back of their head. Does this mean we should not come together? It would be out of line with scripture to suggest such. But the trap many are ensnared in is this thought that the Church is visible to the natural eye while, in reality, what is being promoted popularly as 'the church' is but a masquerade. Yeshua taught us that the Kingdom is within each of us and does not come by observation (Luke 17:20-21). Another tradition is that we need to be 'covered' by someone in the Body. Notice in this passage from Genesis above that the first thing to happen when they realized they were naked was to fashion something of their own handiwork to 'cover' their loins. How many times have you heard it said among those who are keepers of present day tradition that you need a home church or a group of men or an individual to serve as a 'covering' for you, to 'protect' you? Yet, if we measure all scripture against the Life of Yeshua, we do not find recorded anywhere in His Life, Who lived as an example for us to follow, that He or the disciples ever built, endorsed or lent himself to any religion, structure, organization or institution (Philippians 2:7) - and there were plenty around in His time to become involved with had that been His design. (see No Fellowship - No Problem). While He was in the temple daily (Luke 19:47 and elsewhere) because that was where the people were, He did not become part of the religious structure that tried to control them. When men allow tradition, darkness into the brilliance of His Temple, His Presence, the first casualty is the diminishing of the ability to hear His Voice for oneself. 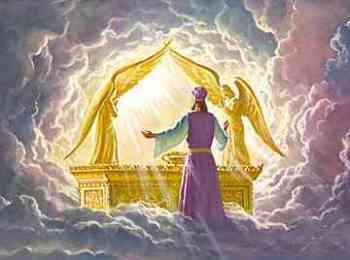 YOU are the temple of Elohim (1Corinthians 3:16). Notice what is said in Ephesians 6:14 - HE is your covering (John 14:6). 2) a giving which is done by word of mouth or in writing, i.e. tradition by instruction, narrative, precept, etc. The reason men embrace tradition is because they have some investment in it - financially, prestigiously, manipulatively or ignorantly (they really don't know any other way). The reason they perpetuate it is from a need to justify what they are doing as right in their own eyes (Proverbs 21:2). The more people they can align to their way of thinking helps to mitigate their standing. But, it is in the act of, the embrace of the loincloth that we 'give up' our place in His Presence and our hearing becomes 'covered'. The Greek word for follow is akoloutheo and means to cleave steadfastly to, to conform wholly to his example, in living and, if need be, in dying also. Cleave in Hebrew is dabaq and means to cling, stick, stay close, cleave, keep close, stick to, stick with, follow closely, join together. For that remnant in which the fire is initiated, it consumes their whole life - everything and everyone that comes in contact with it are also consumed. When a firestorm passes through a community, it does not discriminate about who or what it touches. If you are in the Way of that Fire - you die. This message is not for everyone, but for those of you who have given yourselves totally to the Spirit of the Living Elohim. There have been wonderings and questions about why your life has been falling to pieces around you, in spite of your best efforts. It is because somewhere early on you gave yourself, without reservation, to the Father to do with you as He pleases. He was given permission to do whatever it took in your life to accomplish His Purpose in and through you. The Essence of the Father is that He only enters where He is invited and He only stays where He is welcome (Revelation 3:20 - notice that this entire passage is spoken to believers). He is now calling in that vow. You are being stripped of everything in this world because you are not of this world. You are being prepared for the Kingdom within to be manifested in this earthly realm (Romans 8:19, see A Vision). Stripping is never pleasant. Stripping is painful. Fire burns. But, by that fire, you are being fashioned as an instrument to bring His Purposes into being in this earthly realm. Be Encouraged.